The Carpathian Mountains are Europe’s last great wilderness area – a bastion for large carnivores, with some two-thirds of the continent’s populations of brown bears, wolves and lynx. They are also home to the greatest remaining reserves of old growth forests outside of Russia. Meanwhile, the Balkan Mountains and the Rila-Rodope Mountain Range in Bulgaria contain outstanding natural features that are of global importance, including the Rila and Pirin National Parks, which have been recognised, respectively, as a certified PAN Parks wilderness area and a UNESCO World Heritage Park. A glance at the Alps should raise questions about the wisdom of pouring investments into ski areas in the Carpathians. According to the Organisation for Economic Cooperation and Development, as many as two-thirds of Alpine ski areas could go out of business according to current projections for climate change, while Alpine areas lower than 1,500 m are facing a very uncertain future. 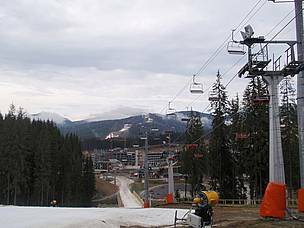 In fact, a 2004 report concludes that alpine ski regions in Slovakia at 1,150-1,500 meters above sea level may be uneconomic by 2030. Ski resorts being developed across the Carpathians and Bulgarian mountain ranges are already including adaptation measures to climate change in the form of snow cannons. But ironically, through their huge consumption of energy snow cannons only contribute to accelerating the rise in temperatures. The estimated 3,100 snow cannons in Europe consume per year and hectare roughly 1 million litres of water and 260,000 kWh of electricity – i.e. roughly as much energy per year as a city of 150,000 inhabitants and as much water as a city the size of Hamburg. Construction of ski facilities of course can have very significant impact on habitats and species, not only due to removal of forest cover and other vegetation to make way for ski runs, access roads and infrastructure, but also due to fragmentation of habitats and wildlife avoidance. Secondary effects such as the abstraction of water for artificial snow production and deterioration of environmental conditions due to heavy tourist flow concentration can also have heavy impacts for biodiversity and nature values. “In the meantime we can all avoid ski areas that do not comply with basic criteria for environmental safeguards and legislation”, she adds. For example, Bansko, in the heart of Pirin National Park in Bulgaria, is a popular ski destination that has become infamous for being the first of a series of illegal ski developments in Bulgarian protected areas. The project received approval from authorities in 2000 and was built in subsequent years. 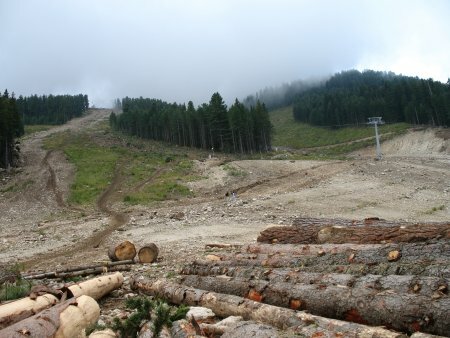 Half of the ski runs in Bansko have no environmental permits, while those ski runs which do have permits have violated each requirement of the Environmental Impact Assessment decision. These violations include for example the width of ski runs - instead of the permitted 30 m they actually are 60 to 100 m wide. The European Commission has initiated penalty procedures against Bulgaria because of violations of environmental law in the case of Bansko. The development has caused significant environmental problems, including landslides in Pirin National Park, but has also had social and economic implications. Bansko was once a popular summer resort, but visitor numbers have dropped in recent years due to higher prices and over-development of the once picturesque town. And as if this is not enough, earlier this year the Consultative Council of Pirin National Park submitted to the Ministry of the Environment a proposal to alter the park management plan in order to permit the construction of two huge new ski zones inside the park. The epidemic nature of the problem is also in Slovakia where authorities have essentially opened the Tatras National Park to development – a marked change as the area has been relatively strictly protected for the past thirty years. As a result, the country’s flagship protected area is facing intense pressure. Five ski areas are being developed around the park, including development of ski runs and expansion of tourist facilities, with little if any state control or proper assessments. As a result, the area could lose its international recognition as a national park by IUCN, the world conservation union. The European Commission has also begun investigating impacts of the developments on Natura 2000 protected areas. Despite international recommendations and pressure, Slovak authorities have yet to adopt clear zoning and management plans for communities in the area. Zoning and planning could guide development and management of the area, ensuring opportunities for development while maintaining the natural values that are the area’s chief attraction. The lack of any planning or guidelines, together with the hands-off attitude of relevant authorities, has essentially given developers free rein to develop the area. In Ukraine, one of the 20 largest ski areas in the world has been stamped out of the ground in the Ukrainian Carpathians, not far from the city of Ivano-Frankivsk. Development of the Bukovel area is continuing, with total investment in the area reportedly planned eventually to reach €3 billion. A total of 66 lifts, 400 km of ski runs, and 100,000 beds, an airport and 15 million annual visitors are planned overall. The development counts on significant artificial snow production, including 500 snow production sites, 300 snow lances, 40 mobile propeller snow cannon and a 100,000 m3 artificial lake to provide water for snow production. The Ukrainian government weighed in behind the project as a site to host the 2018 Winter Olympic Games, although in the end it did not make the bid. Unfortunately, many of the existing and planned ski developments in Romania are also in areas of high natural value, including within existing protected areas and often in areas included in the Natura 2000 network of specially protected sites. Many of these areas are of outstanding natural value, not only of national, but also EU and even global importance. Some 40 percent of the 45 areas with proposed ski facilities that have been identified in a Romanian country study are inside or next to proposed Natura 2000 sites and 17.8 percent will be located in the strictly protected areas from nature and national parks.The most striking examples are the planned ski resorts Pestera Padina, in the Bucegi Nature Park and Padis – 12 km of ski pistes in the strictly protected area of Apuseni Nature Park. The parks are not only flagship parks for Romania and indeed Europe, but also contain key Natura 2000 areas. These projects enjoy very considerable public sector support, both in terms of legislation and approvals as well as direct support for investment. Development of ski tourism is given priority in many planning documents for regional and local development. Many of the projects in EU countries, e.g. Slovakia and Romania, expect to receive very significant support from the EU, especially through co-financing from regional development funds. The €772 million in EU Structural Funds that Slovakia will receive in the period 2007-13 for supporting “Competitiveness and Economic Growth” will include substantial investment in constructing, modernizing and extending ski centres. But for many of the projects, the long-term profitability and public interest is questionable. Bansko, in the heart of Pirin National Park in Bulgaria, is a popular ski destination that has become infamous for being the first of a series of illegal ski developments in Bulgarian protected areas.